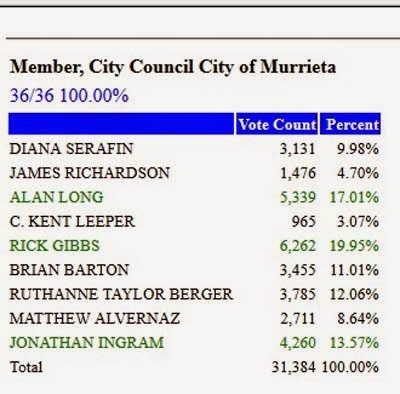 Former mayor Alan Long and council member Rick Gibbs won re-election to the Murrieta City Council Tuesday night, while Jonathan Ingram won the third open seat. Election results aren't official until they are certified by the Registrar of Voters. A significant number of provisional, mail-in and damaged ballots have yet to be counted, and an update of the final tally is due to be released on Thursday. Gibbs received 19.95 percent of the votes cast (6,262) to finish first among the nine candidates. Long received 17.01 percent (5,339) of the votes reported Tuesday night, with 100 percent of the precincts reporting. Long resigned as mayor Oct. 20 but announced that he was continuing his campaign for re-election. He has a Dec. 11 court date to face a felony DUI charge related to an injury accident Oct. 16. Ingram held off Ruthanne Taylor Berger to win the third council seat. Ingram received 13.57 percent of the votes (4,260) to Berger's 12.06 percent (3,785).